Lisa Lollipop, children’s entertainment business has inspired hundreds of children each year with its unique party packages. The business is now celebrating reaching the 1,000 parties mark, equating to c. 5,000 local children having met Lisa Lollipop. Business expansion means there are definite plans to take on more employees in the next month. Lisa Lollipop provides entertainment for children at private parties, schools, hospitals and corporate events within the Aberdeen City & Shire area of Scotland. Lisa Lollipop employees take on the appearance and persona of the fairytale like ‘Lisa Lollipop’ character. Since the businesses inception in 2009, the Lisa Lollipop character has gained a high degree of popularity and achieved strong brand recognition. Families from Aberdeen City and Shire book their children’s birthday parties with Lisa Lollipop year after year. No truer can be said of the Morgan family from Balmedie, Aberdeenshire. Their first party for eldest daughter Lucy was in February 2012 when Lucy was just four years old and each year from then Lisa Lollipop has joined in with the family celebrations. Lucy’s most recent party celebrated her seventh birthday and she’s already planning for her eighth. Lisa Lollipop is available for parties and events big or small. 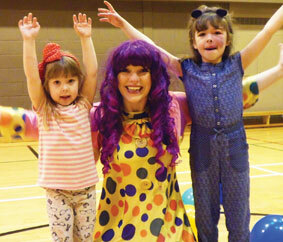 Children’s entertainer, Lisa Lollipop can be booked for your childs birthday party! Parties would normally last about two hours depending on activities. Lisa Lollipop can provide all the traditional party games we love… but with challenging twists.